Dunham is an international phenomenon with sold out stadium concerts, one-half billion YouTube views, and television shows that remain among the highest rated in Comedy Central history. Controlled Chaos is guaranteed to deliver an unequaled number of laughs per minute – whether you’re a Dunham Maniac or seeing him and his partners for the very first time. Jeff Dunham is apparently very popular. Very, very popular, actually. To be honest, though, beyond quick snippets of commercials promoting his various shows, I had never actually seen the man perform before watching this disc. After watching this disc, I can't really understand why Jeff Dunham is very, very popular. With that said, fans of the comedian probably don't need to read the rest of this review at all. If you're already an admirer, then this disc will likely make a solid purchase regardless of what I have to say. Comedy is very subjective, after all, and while I certainly don't mean to put down anyone who likes this style of humor, I just don't get it, and that's not meant as an insult. The truth is… I wish I did. Really, I do. I mean the audience at the show seems to be having a jolly good time. Seriously, there is like a nonstop, constant barrage of laughter perfectly in sync with every punch line. They seem to be in an almost nirvana like state of bliss, and despite what my sometimes cranky, jaded critic sensibilities might imply, I like to laugh. I like to have a good time. I like to smile. Despite my best efforts, I don't think I've ever been as delightfully ecstatic as the crowd of this show, and… I'm jealous. Damn you, Jeff Dunham and your legion of seemingly joyful fans! Why can't I be among you?! Why won't you share your secrets?! 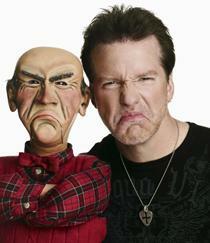 'Jeff Dunham: Controlled Chaos' is the popular ventriloquist comedian's fourth concert special. The disc begins with a pretty uninspired cold open sketch, featuring some of Dunham's famous dummy pals. After the skit, we transition to the real show. Filmed in front of a live audience, Dunham starts off by warming up the crowd completely sans his creepy, lifeless dolls. Using a slide show of some embarrassing pictures from his youth, he draws out some laughs and establishes his fairly likeable stage persona. After this faintly amusing bit is run into the ground, he transitions into the real meat of his show, and busts out the dummies and ventriloquism. Most of his legendary alter egos are present, including Walter, Peanut, Jose Jalapeno, and Achmed, along with a few surprise guests. The comedy is a strange mix of broad, innocuous humor and often outrageously racist material. The comedian essentially plays the good natured straight man to his offensive, politically incorrect dummies, as they spout off various insults and jokes that adhere to uninspired racial stereotypes. Walter is basically a classic cranky old man and one of his major bits involves African houses that are made of cow dung. While I'm not saying his observations aren't worth a laugh or two, it's not exactly the most inspired material. 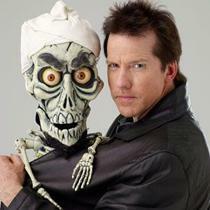 Walter eventually transitions to Dunham's most controversial creation, Achmed. Achmed is a dead terrorist. I mean that literally. He is a skeleton wearing a turban that talks about blowing things up. I don't really think there is anything else that needs to be said about that. Finally, Dunham's last segment involves Peanut and Jose Jalapeno. Peanut is… well, actually I have no idea what the hell Peanut is supposed to be, but he sort of looks like a purple monkey/human hybrid. Jose Jalapeno, as the name might imply, is a talking Mexican jalapeno. The segment with these two characters amounts to little more than terrible Asian and Mexican jokes (though the bit with "Little Jeff" is actually kind of creative). Again, despite my criticism I must admit that I chuckled a few times throughout, but by and large the humor here lacks the type of intelligence or satirical edge that would justify such blatant racial stereotypes. Some might find the material to be offensive or conversely hilarious, but for me, it's all too stupid to be either. 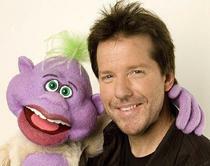 Even though this isn't exactly my style of comedy, I do think that Jeff Dunham is a talented man and performer. His ventriloquism skills themselves are pretty impressive and his ability to convincingly become two (or in some cases even four) different characters at once is fairly remarkable. Each of his creations has a distinct personality, and the juxtaposition between their heightened personas and the comedian's normal, everyman quality is what makes the show work (sort of). If Dunham just went on stage as himself and said the things he says as Walter or Peanut, I don't think even his biggest fans would be laughing, but by filtering the material through his dummies, he's able to get away with it and make it funny. Well, not to me, but to others. Many, many others. There is undeniable skill at play here, and though I may not appreciate it myself, his fans should probably find a lot to like with this show. Comedy Central presents 'Jeff Dunham: Controlled Chaos' on a BD-50 disc packaged in a standard case. Upon start up the disc asks whether you would like to watch the "bleeped" or "unbleeped" version. As the two figurative roads were diverged before me, I chose the "unbleeped" version, and that has indeed made all the difference. Which is to say, I got to hear some naughty words. The show is provided with a 1080i/AVC MPEG-4 transfer in the 1.78:1 aspect ratio. Shot digitally in high definition, the program has a pleasing but unimpressive appearance. The source is pretty clean but there is some noise visible from time to time. Detail is nice, but being a pretty basic standup show there really isn't a whole lot to see outside of a guy and some dummies sitting on a stage. Colors are good, with decent levels of saturation, offering a bright, pleasant look. Black levels and contrast are both solid but the image has a mostly flat appearance that lacks true pop or depth. This is a pretty unremarkable but perfectly acceptable transfer. There are some minor artifacts, but they don't detract from the show. The actual content doesn't lend itself to much variety or visual flash, but this looks just fine. The movie is presented with an English Dolby 5.1 TrueHD track and an English Dolby Digital 2.0 track with optional English subtitles. Like the video, the audio serves the show well but isn't particularly noteworthy. Dialogue is clean and full and all of Dunham's silly voices come through nicely. There is some occasional directionality between the characters, sending different voices to different channels across the front soundstage depending on where they are positioned. Rear speakers provide some faint crowd reactions, laughter, and applause, adding a welcomed level of immersion. Dynamic range is pretty flat but there isn’t any distortion among the frequencies. Bass is essentially absent, except during the cold open sketch which features a few lively sound effects including a revving engine and even an explosion. Balance is pretty consistent throughout the show, with Dunham's dialogue emphasized, but the standup act is mixed a little lower than the opening skit. 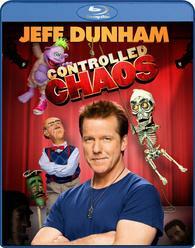 'Jeff Dunham: Controlled Chaos' sounds pretty decent. It gets the job done, but like the video, the actual material just isn’t meant to impress. Comedy Central has included a solid collection of various very brief special features, including a few outtakes and skits. All of the supplements are presented in 1080i with Dolby TrueHD 5.1 and Dolby Digital 2.0 tracks along with optional English subtitles. Bubba J Winery Tour (HD, 2 min) - This is essentially a brief commercial for Dunham's wine (yes he makes wine) that features his completely unoffensive character Bubba J taking us through a tour of his winery. Outtakes (HD, 2 min) - Some flubs from the show's taping are included. These are actually fairly amusing and it's pretty odd how Dunham seems to have the most trouble when he's just talking normally as himself. The Necklace (HD, 1 min) - More outtakes are presented that feature Dunham's stupid necklace as it continually gets in the way of his microphone. Share the Hair (HD, 1 min) - Even more outtakes, this time showing Dunham interacting with some of the backstage staff. Flirting with Victoria (HD, 2 min) - Yes, yet even more outtakes, this time featuring Jeff and his puppets flirting with the makeup artist. Backstage with Peanut (HD, 3 min) - This is a skit filmed for one of Dunham's comedy tours that features Peanut giving us a look backstage. If you like the character you may get a laugh out of this. I, however, did not. Achmed's Terrorist Video (HD, 3 min) - Another skit filmed for one of Dunham's tours featuring a mock terrorist video for Achmed. Again, I didn't find this funny. Getting Ready for the Tour (HD, 3 min) - This is the last of the skits from Dunham's tour, this time featuring the comedian and his puppets as they prepare to hit the road. Dunham Goes Global (HD, 4 min) - Included here are some brief clips from Dunham's international shows interspersed with quick interview snippets from his adoring, foreign fans. Photo Shoot (HD, 1 min) - A backstage look at a photo shoot with Dunham and his dummies is included but doesn't really offer much worthwhile to see. Making of the Achmedmobile (HD, 14 min) - This is a surprisingly interesting look at the making of the Achmedmobile that's featured in the show's cold open. We follow Dunham as he painstakingly retrofits a famous hot-rod's skull hood ornament to look like his dummy Achmed's head. Instead of hiring people to do it for him, Dunham actually does most of the work himself and uses some fancy 3D scanning machines and printers to create a large sculpt of his dummy's skull. In addition to the pretty interesting process, this featurette really shows how strong Dunham's work ethic and range of skills really are and certainly made me appreciate his talents more (even if I do find him to be unfunny). 'Jeff Dunham: Controlled Chaos' appears to be more of the same from the comedian, which should please fans but scare off detractors. While I don't find Dunham's often dumb and racially charged style of humor to be funny, his ventriloquism skills are fairly impressive. Video and audio quality are pretty basic but serviceable, and supplements are occasionally amusing but short and not terribly insightful. This is a solid disc for a pretty mediocre show, but big fans should be pleased.